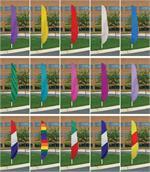 Feather Flags made in the USA, solid color, longest lasting up to 2 years nylon 200 denier. Sizes 6 ft to 18 ft, choose your color to match your business or school flag colors. MINUMUM ORDER 12+ FLAGS, 8 FT TALL FEATHER FLAGS NYLON MADE IN THE USA, PREMIUM POLE SET 9 FT TALL WITH GROUND SPIKE. MADE IN THE USA, CHOOSE YOUR COLOR( MINIMUM 2 FLAGS PER COLOR) 2 weeks to ship out.